What I Want for Christmas 2017. 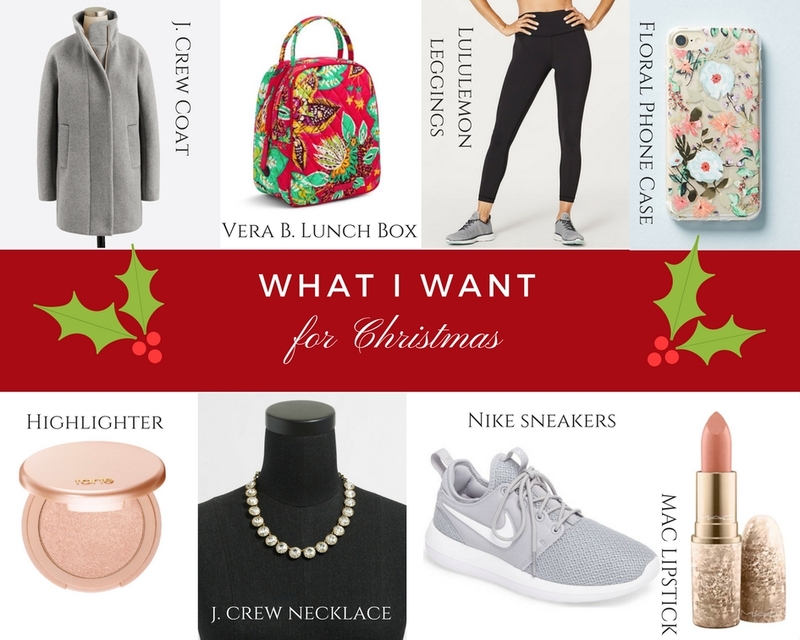 I thought it would be fun to share my Christmas wish list with ya'll in case you needed some ideas to add to your own list or maybe you'll see something that might be a great gift to give! This year I kind of struggled coming up with items to put on my list. What is it that I really need?! (I am an impatient person and if I want something I go out and get it right away... I can't wait for Santa to bring it to me ;) LOL. After racking my brain for a while, I finally came up with some items that were suitable for my Christmas wish list. You can check below for all the details! 1.) J. Crew Coat: I work at J. Crew Factory and have been eyeing this beauty up for weeks now. I don't own a gray coat and I think this one would be a great addition to my collection. 2.) Vera Bradley Lunchbox: While I may not be in school anymore, I do pack a lunch for work and having a cute lunchbox like this one would make me smile. 3.) Lululemon Leggings: I have been dying to get a pair of Lulu leggings for a while now but just haven't bit the bullet and gotten them for myself yet. Pleeeeease, Santa! 4.) Floral Phone Case: My marble phone case that I have at the moment is looking a little dull so I thought a pretty floral one like this would brighten things up a bit. 5.) Tarte Highlighter: This is my favorite highlighter and I just ran out! It gives the most gorgeous, natural glow. 6.) J. Crew Necklace: Again, I see this pretty little thang at work every week and I think I need it in my life. Crystal necklaces like this pair with literally anything! 7.) Nike Sneakers: I am trying to get back into the gym again and a cute pair of gray sneakers might make that a little easier. 8.) Mac Lipstick: Mac lippies are my absolute fave! The shade Holiday Crush looks like the perfect "everyday pink." Vera Bradley lunch boxes are the best! And I love that phone case! I'd love to receive a pair of Lululemon leggings. I also just published my holiday wish list on my blog.